Last updated 18:00GMT, Thursday 19 February. TODAY: earlier thick fog around France, from south west to north, with visibility much less than 100m in places (Poitiers, Marce, Tours). Black ice warning Limoges area. SNOW: on-going ‘snow chaos’ (mandatory chains) in Istanbul and parts west, central + south Turkey (record breaking snow says Hurriyet) + Cyprus, too. NEWS: Roll-Royce spells out the future of ferry design, powered by LNG. Frustrated or distracted drivers have meant a large rise in red light jumping in Belgium. Contracts are signed on Crimea’s controversial Kerch Bridge. CHANNEL DELAYS: DFDS Dover-Calais delay increased to 3h00. P&O Dover-Calais services ‘within 25mins of schedule’. MyFerryLink Dover-Calais delay 45mins. Condor Ferries, bad weather tomorrow (Friday 20 February) afternoon/evening, Jersey cut from fast ferry schedule. Eurotunnel car shuttle France, delay border control 30mins. WEATHER ALERT: no red or amber alerts currently. WEATHER: dry. Windy but mild Scandinavia. Rain France/Spain. MAJOR TRAFFIC DELAYS: A3 westbound into Regensburg, accident, lanes closed, delay 45mins. A96 northbound to Memmingen, accident Wangen delay 50mins. Earlier: now no delay A2 northbound into Maastricht. A3 northbound from Cologne, Leverkusen earlier accident, delay down to 20mins. A86 ring north Paris anticlockwise, road works, delay down to 20mins. A28 eastbound Amersfoort, earlier accident, delay down to 15mins. A40 eastbound Essen, road works, delay down to 10mins. A1 eastbound to Zurich, accidents Solothurn + Harkingen total delay down to 15mins. 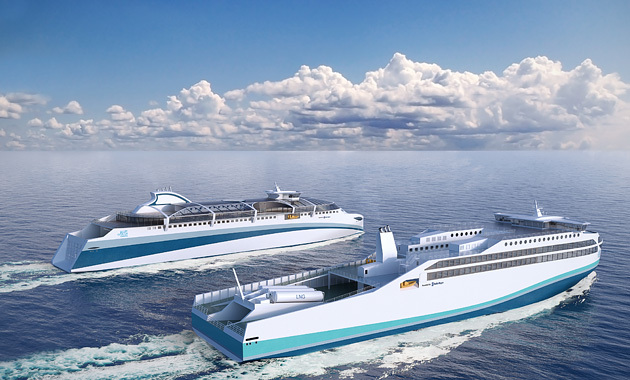 Marine engine supplier Rolls-Royce sees the market for ferries splitting two ways and has designed a pair of concept ships to illustrate its ideas. Clear Blue (above right) is a no-frills minimalist vessel designed to cut upfront investment. Roll-on, roll-off truck trailers double as galley stores and fuel tanks with pre-fab, modular cabins and shops easy-installed on top of the superstructure to minimise construction costs and a single no-ramp entry/exit for vehicles. Meanwhile, Dynamic Blue emphasises passenger comfort with services, shopping and stairs all on the port side and a glazed roof covering the public deck to maximise light and the feeling of space. Powered by different versions of Roll-Royce’s clean fuel Liquid Natural Gas (LNG) powered Bergen engines, the company says the designs cut energy use by 15-25%. roundup: BELGIUM. Bods are unable to come up with a consistent explanation about the sudden large rise in red light jumping: up 10,000 last year to 99,000 incidents says Deredactie.be. Police say drivers are becoming more careless; the Belgian Institute for Road Safety (BIVV) says drivers are frustrated with growing jams. Meanwhile, newly introduced successive speed traps – so-called ‘speedcontroles’, where fixed cameras are supplemented with mobile traps – netted 27,000 drivers last year says FlanderNews.be. SPAIN. The tolerance of speeding radars is being made uniform across the country announces roads directorate DGT (via @DGTes). For speeds up to 100kmh the allowance is 7kmh; above that drivers are allowed 7% (i.e. for the new national speed limit of 130kmh, drivers will not be prosecuted at or under 139.1kmh). 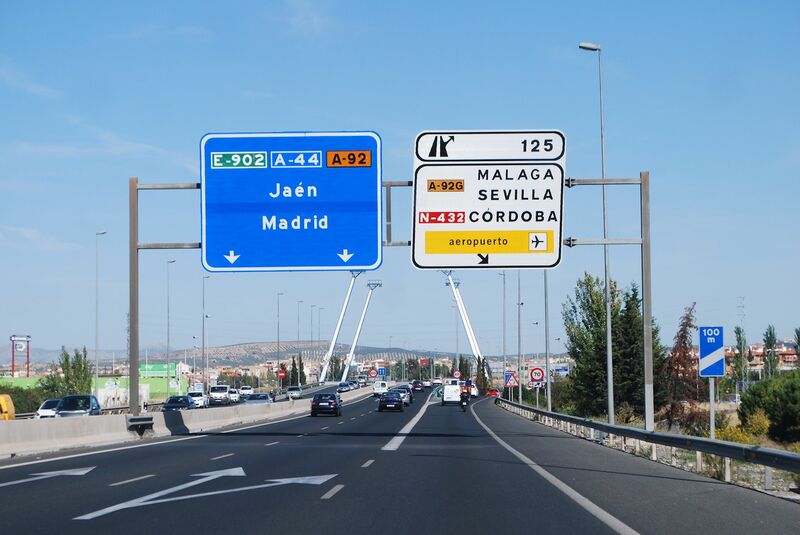 DGT also says the location of mobile speed cameras will from now on be published on its website and all cameras, fixed and mobile, will be made clearly visible, with warnings, to drivers reports El Pais. CRIMEA. The construction contract for the Kerch Bridge between Crimea and the Russian mainland – what will be the only direct, fixed link between the two – has been signed reports Crimea News Agency. First use is scheduled for December 2018 with completion on 30 June 2019. The budget is RUB247bn (2.6bn).